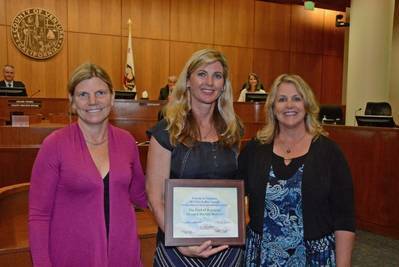 The Ventura County Board of Supervisors has recognized the Port of Hueneme for its environmental initiatives, presenting it with the County of Ventura 2017 Earth Day Award for Excellence in Environmental Stewardship. The award was presented by Supervisor Kelly Long to Oxnard Harbor District Commissioner Mary Anne Rooney and Port Director & CEO Kristin Decas. Every year in recognition of Earth Day, the Ventura County Board of Supervisors recognizes sustainability leaders in the community. Each Supervisor can recognize one such leader, and this year Supervisor Long put forward the Oxnard Harbor District as the top organization to honor. In 2012, at the direction of its Board, the Port adopted a robust series of strategic initiatives referred to collectively as the Environmental Management Framework. This ambitious project included the rollout of several strategic implementation plans that would advance environmental values important to the Port, values including air and water quality, protection of marine resources, healthy soil and sediment, and climate change adaptation. The Plan sets long and short term objectives as well as evaluation strategies. For the last two years, as well as in 2017, the Port has been an accredited member of the Green Marine program, a wholly voluntary eco-accountability program that monitors and publically publishes its members’ progress towards various environmental initiatives. With funding assistance from the Ventura County Air Pollution control District, the Port is installing electrical vehicle charging stations in publically accessible areas. Of significant note, the Port installed systems so that vessels can plug in at dock in lieu of running diesel auxiliary engines. Other advances include purchasing electricity at off peak hours, storing the electricity in large battery packs on Port and then using that stored electricity during peak hours, saving energy and money. The Port is also standing new prototypes of LED lighting structures to increase efficiency. A most recent operational priority is to produce zero waste. The Port is also proud of its recent partnership with the Smithsonian Environmental Research Center (SERC), where a study was completed looking at invasive species that arrive at the Port (usually on the hulls of cargo ships) and assessing their impact on the native ecology. Embedded in its mission statement, the Port is committed to providing the maximum possible economic and social benefits to the people and communities it serves. “Our pursuit of strong and active environmental policies and programs will continue to be integral to the day-to-day operations of the Port of Hueneme,” added Kristin Decas, CEO and Port Director.